These street signs can be found in Paisley, Ontario. 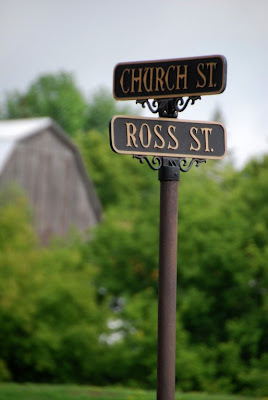 Ross St runs parallel to the main street (Queen St) and at this intersection, near the barn, you can find the Farmer's Market held every Saturday morning from Victoria Day to Thanksgiving. until I tried to read another pair of signs. The fancy script was a bit hard to decipher, especially if you weren't familiar with the town. 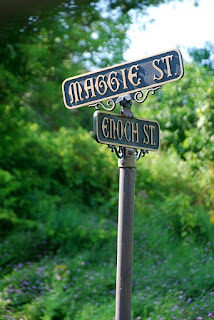 and felt a little sad for this end of Maggie St. It all sounds very Scottish! lots of Scottish names in these parts! Those signs do have fancy script that is not the easiest to read. I hope the paramedics know their way around town! Indeed some signs for eternity. although, I do wonder what happened that they needed a new "maggie"?! Must be hard to read at night! True. It's probably not allowed to make non-reflective street signs nowadays. I hope they replace the plain Maggie with a fancy version! I somehow suspect that those fancy ones are too expensive now! I bet somebody stole the fancy Maggie sign on that one corner and nowadays they are replacing them wit plainer ones. Poor Maggie! The rest of the signs are such a nice font for sure! they are only on a few blocks of the 'downtown'. maybe that end of Maggie St is the borderline?! They have a solid look to them, for sure. 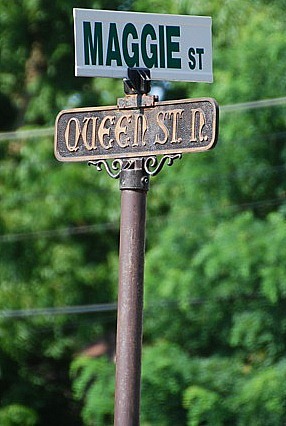 I don't think I've ever seen street signs quite like these! The plainer one is definitely easier to read. I've quite enjoyed seeing the varieties of signs in each town.